This video introduces the LWT Series level transmitters from ABB. The ABB LWT Series is a family of guided wave radar transmitters utilizing the most advanced level algorithm, LevelExpert. With LevelExpert, you no longer need to be an instrument expert to accurately control level. With the LWT Series, the expert is inside. To meet the most challenging level applications, the LWT300 series of instruments offers a wide range of configurations. The ABB KM26 Magnetic Level Gauge provides custom engineered solutions to liquid level applications in industries such as: oil and gas, refinery, chemical, petrochemical, power generation and many more. The KM26 MLG has proven itself to be a safe, reliable, maintenance free solution for total and/or interface level detection in toxic, corrosive, high pressure and high temperature processes. 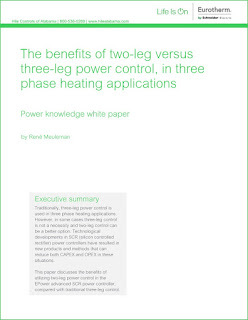 White paper courtesy of Eurotherm Schneider Electric. 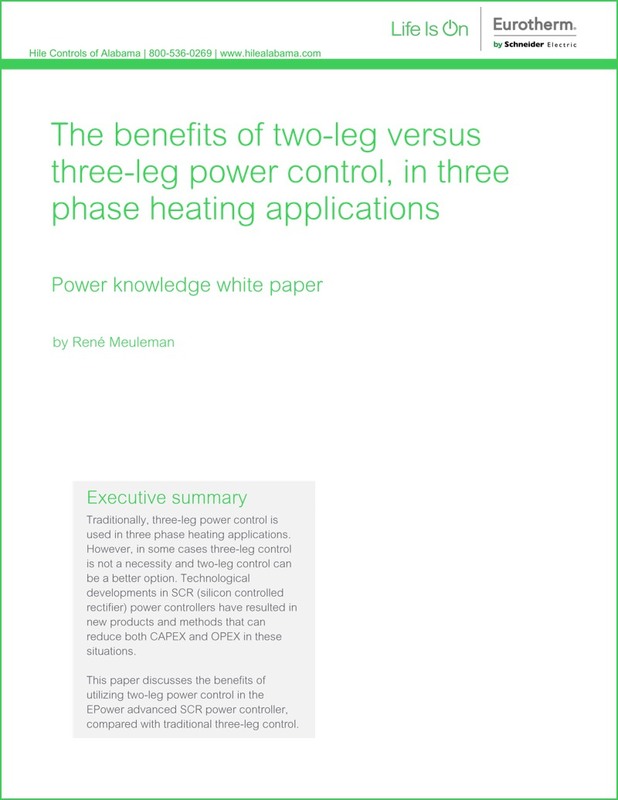 Traditionally, three-leg power control is used in three phase heating applications. However, in some cases three-leg control is not a necessity and two-leg control can be a better option. Technological developments in SCR (silicon controlled rectifier) power controllers have resulted in new products and methods that can reduce both CAPEX and OPEX in these situations. This paper discusses the benefits of utilizing two-leg power control in the EPower advanced SCR power controller, compared with traditional three-leg control. You can download the entire Eurotherm white paper from this page on the Hile Controls of Alabama web site. IN-FLOW Mass Flow Meters and Controllers up to pressure rating 400 bar (5800 psi) are now available with FM approval for Class I, Division 2, for the North American market. These MFCs are available with a rugged IP65 (dust - and waterproof) construction and an optional ATEX approval for use in Category 3, Zone 2 hazardous areas. 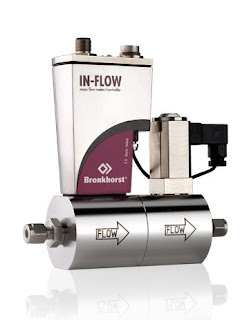 Additionally, Bronkhorst is now offering a PROFINET fieldbus interface on their industrial mass flow meters and controllers for gases (FM and ATEX approvals pending). PROFINET is looked at as the new standard for industrial automation, offering major savings in configuration and commissioning. Optimal diagnostics of devices as well as the network. For more information, contact Hile Controls of Alabama. Call them at 800-536-0269 or visit their web site at https://hilealabama.com. 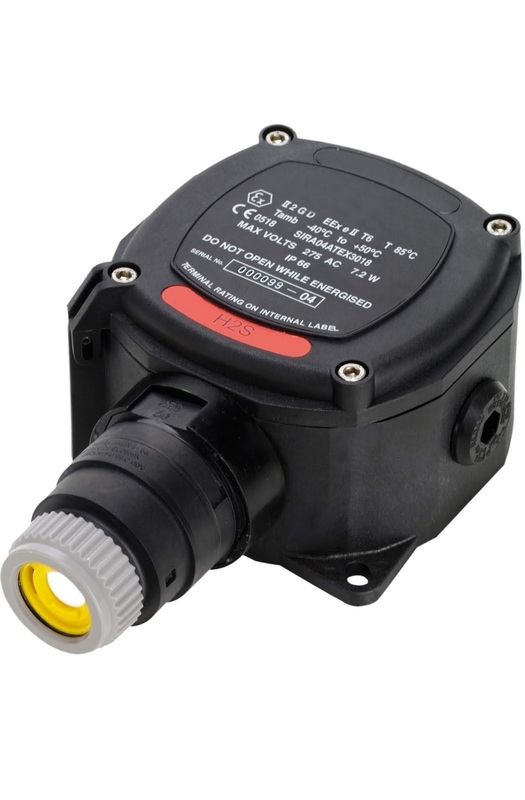 The Autrol APT 3500 Smart Pressure Transmitter is a microprocessor-based high-performance transmitter, which has flexible pressure calibration and output, automatic compensation of ambient temperature and process variable, a configuration of various parameters, communication with HART protocol. The application is very various, as measuring liquid, gas or steam flow as well as pressure and liquid level by an application method. All data of the sensor is to be input, modified and stored in EEPROM. For more information about Autrol instrumentation, contact Hile Controls of Alabama. ProComSol is the creator of the innovative DEVCOM 2000 SMART device communicator, a breakthrough that converts an ordinary laptop PC into a full-featured HART communicator. With the DEVCOM 2000 software and a HART modem you can configure transmitters and control valves on the bench or in the field quickly, easily and economically. For unprecedented levels of convenience, efficiency, and safety, the DEVCOM 2000 system is also available with Bluetooth capability for communication with field devices. This can be handy for devices installed in unsafe or difficult to reach locations. ProComSol, which stands for "PROcess COMmunication SOLutions", is the leading provider of field-proven HART communication solutions for industrial applications, and was the first to deploy Bluetooth technology to configure and troubleshoot transmitters and control valves. advantages of a powerful and flexible, yet familiar and intuitive, tool to meet many of your industrial automation needs. For example, the PC can effectively store and present configuration tools user manuals, operating procedures, reports, and a host of other tools. Configurations can be saved as PDF files in order to keep a record of all up-to-date configurations of your devices. 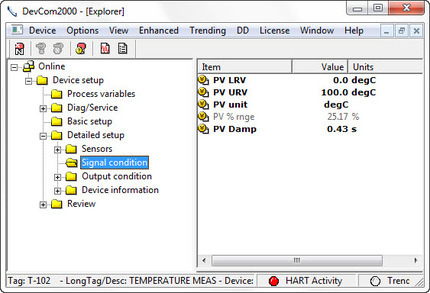 The PC makes it easy to integrate HART information into your reports and emails. This not only gives you the potential for system-wide productivity increases, but also eliminates the need to purchase and maintain a separate handheld HART communicator. The DEVCOM 2000 software has been tested and proven by more than a thousand users in many industries including oil and gas refining, chemical and petrochemical, power generation, water and wastewater, pharmaceuticals, pulp and paper, mining and metals, and food and beverage. Quality is an integral part of the design, development, and production of ProComSol products. Their quality management system has been certified to ISO 9001. Last, but not least, unlike handheld HART communicators that typically cost between $4000 and $7000 dollars, the DEVCOM 2000 system costs approximately $1000 and can be easily and economically upgraded to include additional functions as they become available. Each DEVCOM 2000 comes complete with warranty and free software upgrades during the first year of ownership. The DEVCOM 2000 Windows Explorer interface is intuitive and easy to use. Menus's are clearly available, as are the variables list. Because it's on the computer screen, the menu structure can be expanded or contracted as required so there is no need to dig through small device menus to perform a task. With the full keyboard available, data entry is also easy. The computer screen continuously displays the variables, with items in bold being editable and items in grey being read-only. Edited variables are shaded in yellow, which means the variable has been edited but not yet committed to the device. After clicking on the send icon, the yellow shading goes away and the variable has been changed in the device. It's that simple. HART Protocol's popularity is partially based on the ability to "get data out of the field device" through a data file called a Device Description (DD). The DEVCOM 2000 includes a list of DD's in the DEVCOM 2000 software. The DEVCOM 2000 uses the compiled device description binary file the DD developed by the device manufacturer and registered with the HART Communication Foundation. Each DD has been tested by the device manufacturer. This is an important point because we know that every DD will work with the device be it a transmitter or control valve. The Windows Explorer interface enables other DD's to be easily added in the field. In fact, because it's so easy to add DD's in the field, many device manufacturers are using DEVCOM 2000 to test new DDS that they are currently developing. The DD library is updated and published four times per year by the HART Communication Foundation and new DEVCOM 2000 updates are available shortly after. Updates can be downloaded for free from the ProComSol website during the one-year warranty period, and in subsequent years by paying a nominal library subscription fee. 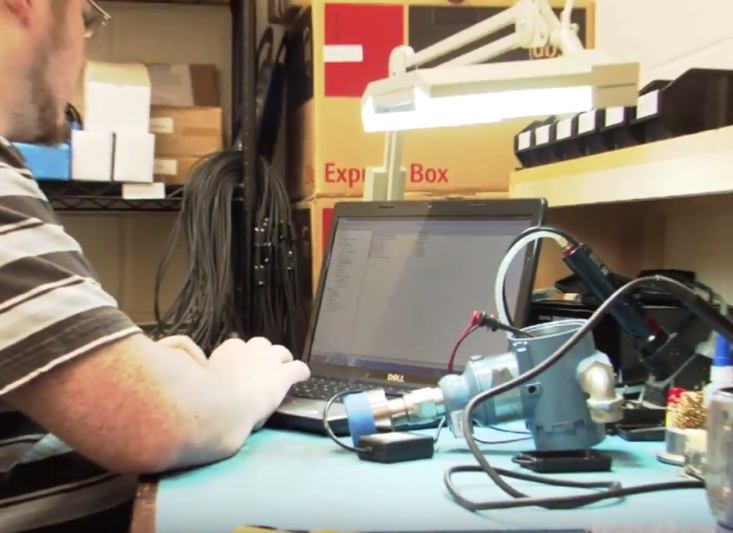 For more about DEVCOM 2000 or any ProComSol product, contact Hile Controls of Alabama. They can be reached by phone at 800-536-0269 or by visiting https://hilealabama.com. 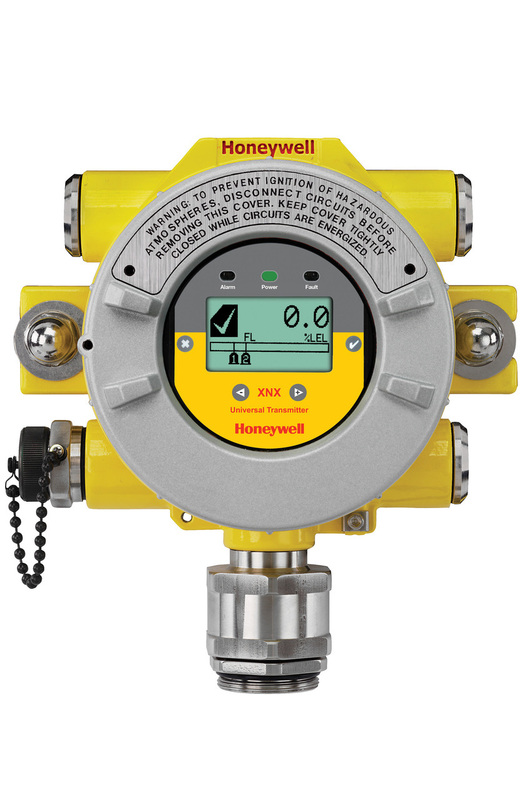 For more information about Honeywell Analytics gas detection solutions, contact Hile Controls of Alabama by visiting their web site (https://hilealabama.com) or calling 800-536-0269.